The most famous home in the United States, after The White House, welcomes over 600,000 visitors a year and has been host to over 20 million guests since opening in 1982. The mansion was built in 1939 by Dr. and Mrs. Thomas Moore who named it “Graceland” in honor of Mrs. Moore’s Aunt Grace who was the original land owner. The property was formerly used as a working cattle farm where prize Hereford cattle were bred. Elvis Presley bought Graceland in 1957 for $102,500. The house was approximately 10,000 square feet at that time. With Elvis’ renovations over the years, Graceland now has 17,552 square feet of living space. Graceland was designated a National Historic Landmark in March of 2006. Voted #1 “Best Musical Attraction” worldwide, #1 “Best Iconic American Attraction” and #1 “Best Historic Southern Attraction,” and #1 Tennessee Attraction in 2018 by the USA Today 10Best Reader’s Choice awards. Mansion tours now features interactive iPad narration with iBeacon technology, creating a fully immersive visitor experience. Through exclusive interactive, digital content, visitors can now view home movies and never-before-seen interviews. Guests can also capture their own tour photos directly on the iPad and e-mail them to their friends and family. Elvis Presley is a social media influencer with a combined reach of over 14 million Facebook fans, 3.7 million YouTube views, and over 2.4 million monthly website page views. The Graceland Archives is the most extensive archival collection devoted to a single individual, with over 1.5 million documents, artifacts, photographs, costumes and memorabilia. The most recent addition to the home was the return of the original, white, baby grand piano Elvis bought for Graceland which is now on display in the music room at Graceland. Currently, there are more than 450 Official Elvis Presley fan clubs authorized by Graceland in over 50 countries. Every August, Graceland hosts Elvis Week, an annual celebration of Elvis’ life and legacy, which attracts tens of thousands of fans worldwide. The biggest names in entertainment, music, pop culture and politics have visited Graceland, including: Prince William, Prince Harry, Sir Paul McCartney, Bruce Springsteen, Bono, Justin Timberlake, Carrie Underwood, Taylor Swift, Katy Perry, and many more. Graceland was the sight of an official state visit when President George W. Bush welcomed Japanese Prime Minister Junichiro Koizumi in 2006. Graceland Auctions has held authorized “Auctions at Graceland” featuring authenticated Elvis artifacts from third-party collectors (not from the treasured Graceland archives). Elvis Presley Enterprises expanded the Elvis Presley experience at Graceland in 2017 by opening the 200,000 square foot entertainment and exhibition complex, Elvis Presley’s Memphis. 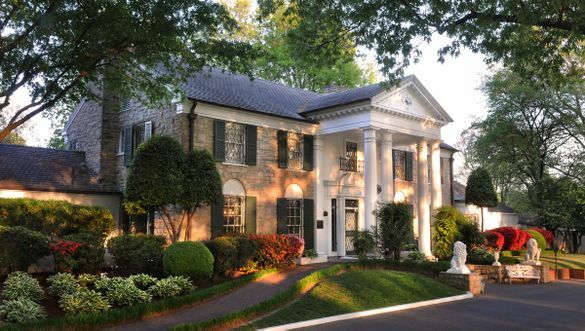 In addition, fulfilling a dream of Elvis’ to build a state-of-the-art guest house for visitors to his home, the AAA Four Diamond resort, The Guest House at Graceland opened in 2016 with over 400 rooms, including 20 specially designed suites, meeting spaces and flexible ballroom space, a 400-seat theater, and three restaurants on-site. This was the most significant enhancement to Graceland since it opened to the public and the largest hotel project in Memphis in over 90 years. Additional fast facts are included in this media kit for The Guest House at Graceland and Elvis Presley’s Memphis.